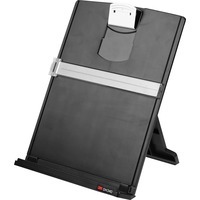 Document holder features a sturdy, stable design with nonskid bottom that stays secure on worksurfaces. Versatile sliding clip accommodates both portrait and landscape documents. Grooved ledge and clip hold up to 150 sheets of paper and oversized documents. Adjustable line guide allows for easy data entry and keeps papers from blowing away. Fold document holder flat for easy storage.